What’s caused bitcoin prices to shoot up like a rocket to over $200 in the past week? The price briefly hit $205.50 at Mt. Gox and is still offered at $200, though other exchanges are mainly offering bitcoin between $180 and $190. All clues are pointing to China. In a one-two punch combo which knocked out offers all the way up to and beyond $200, first the search giant Baidu, commonly referred to as the “Google of China” announced it would be accepting payments in bitcoin. Specifically, a subsidiary of Baidu, Jiasule (“Baidu Accelerated”), a cloud-based anti-DDOS service and content delivery network, has started to accept bitcoins for payment. 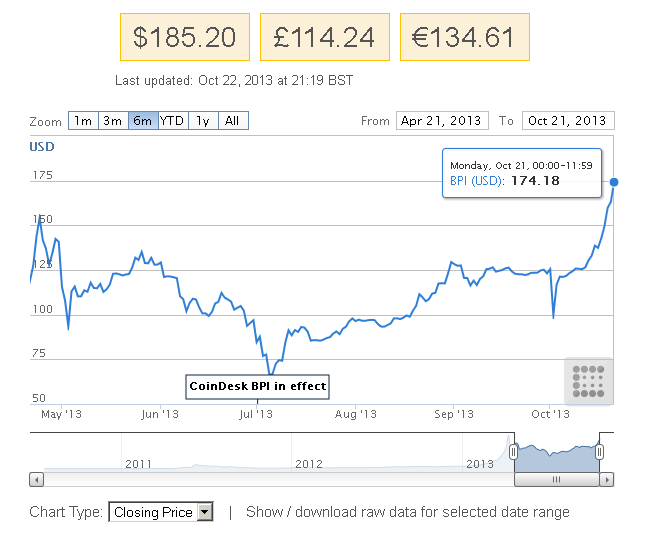 The Coindesk Bitcoin Price Index “BPI” is currently at $185.20. Secondly, BTCChina, which is now the 3rd largest bitcoin exchange worldwide, is widely reported to have doubled trading volumes in just the past week on the buzz surrounding Baidu’s big announcement. Returning to a high last seen in April, when China also briefly overtook the U.S. in downloads of the Bitcoin QT software, BTC China has quickly caught up in volume to both Mt. Gox and Bitstamp.